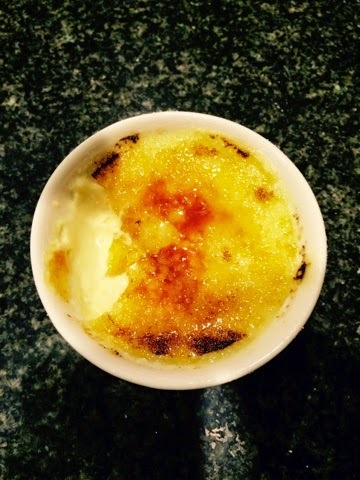 Creme Brulee is my husbands favorite, and I think it took me about four years before I finally made it for him because I had always thought it looked so daunting. It really isn’t so difficult, just a bit time consuming, not so much in preparation as in waiting for it to cool in the fridge! 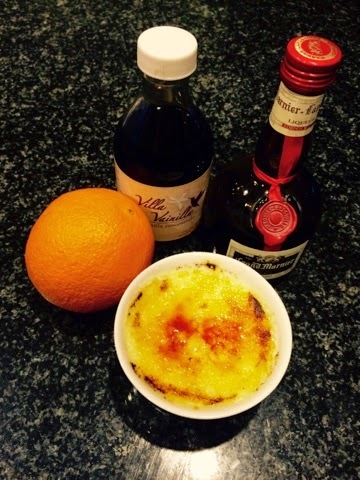 My favorite way to make creme brulee is with a bit of orange flavor and if I am making it for just the two of us, I still make the whole recipe, which serves six, and freshly brulee the tops each night for dessert. The crack of the freshly bruleed sugar topping into the smooth velvety pudding is a thing of magic! Since Creme Brulee only uses the egg yolks, I usually make sure I whip up some meringues with the whites so I haven’t wasted half a hen’s bounty! You’ve got to respect the chicken. Having both a stand mixer and a blow torch make this recipe easier and help produce a more consistent product. If you don’t own either of these however, you can always get away with good old stirring, a hand held mixer and your oven broiler. 2)Set about 2-3 inches of water to simmer a double boiler or an uncovered in a saucepan that fits the bottom of your mixer bowl. 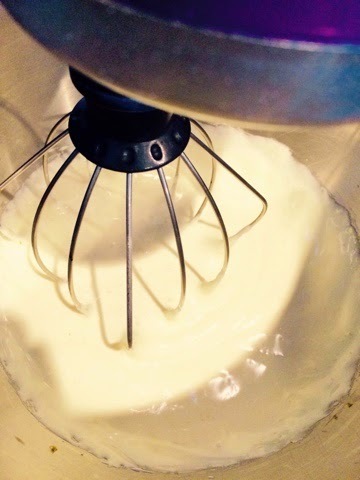 5) Set your mixer to stir, or a low setting, and slowly pour in the warm cream. Now add the orange zest and Grand Marnier. 6) Pour mixture into your double boiler, or if you have used your metal mixer bowl, simply place it on top of your simmering saucepan. 7) Cook for about 5 minutes, whisking frequently, until the mixture has thickened and easily coats the back of a spoon. 8) Fill your kettle with water and set to boil. 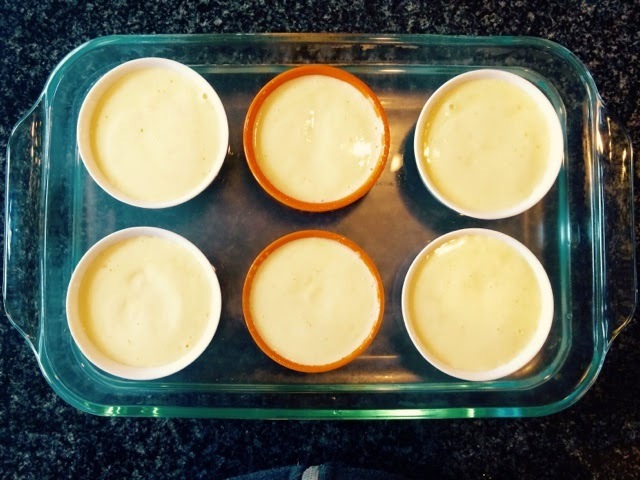 While the water is heating up, grease 6 ramekins with Pam spray and place them in a casserole dish. 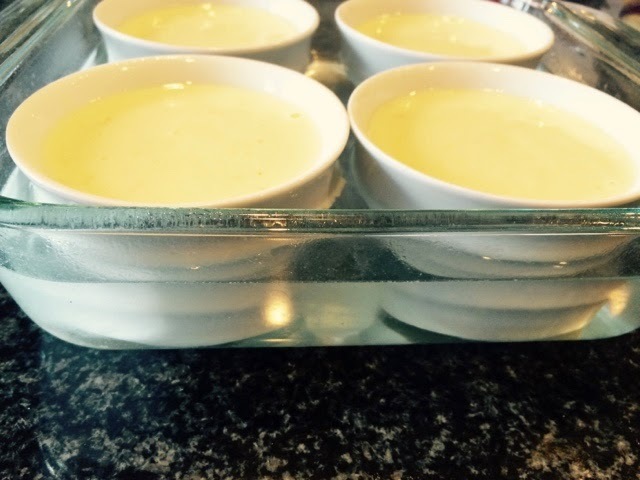 Pour in the boiling water until the it comes about 3/4 the way up the ramekins, to make a bain-marie. 9) Bake for 30 minutes in your preheated oven. When done, let cool on the counter until you are able to remove the ramekins from the water. 10) Chill in the fridge overnight or, if you are serving sooner, remove water from casserole dish, add ramekins back in, and place ice cubes in the dish. I find if I do this, I can usually have fully set creme brulees in 1-2 hours. 11) When ready to serve, cover the tops with a generous coating of the extra sugar (about 1/2 tbsp each). Set your blow torch to medium heat and run the flame back and forth over the tops until the sugar liquefies and bubbles. You want the tip of the blue flame to just touch the sugar, it should caramelize quickly, but not be on so high that the burnt sugar is black and smoking. Let stand a few seconds to cool the tops and then serve immediately.